An Amsterdam airport taxi provides one of the most comfortable means of transportation to get to the Amsterdam city center among many other destinations. The airport taxis are from different companies and they also offer transportation services to all the major towns in the Netherlands. An Amsterdam airport taxi will charge you a fixed price of 39 Euros from the airport to the Amsterdam city center, online reservations can cost up to 49 euros. Taxis are usually readily available at Amsterdam Schiphol Airport and they have been providing travelers with a convenient and easy way to travel into nearby Amsterdam and its surroundings. A traveler can easily find the taxi ranks as they are located just outside of the airport's arrivals hall. The journey to Amsterdam city will take around 15 minutes, depending on traffic flow; during peak hours the taxis may take longer to arrive there. A traveler should always use the official Amsterdam airport taxi at all times to ensure safety and also to avoid being overcharged. In addition, a traveler always has the option of booking a taxi at Amsterdam Schiphol Airport in advance if one’s situation dictates this. There are usually plenty of taxis in supply though. It is also important for travelers to know that you cannot hail a taxi from the streets. If you need to catch a taxi you have to go to the designated areas where taxis form lines. If you are in a hotel or restaurant, the employees will be happy to call a taxi for you. 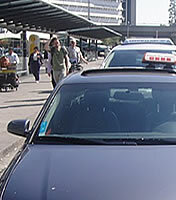 An Amsterdam airport taxi normally starts by charging the basic fare to Amsterdam. Additional charges may come up, usually from luggage, late-night driving, and traveling on public holidays. It is therefore important that you enquire about all these factors from the taxi driver before you embark on a journey using a taxi. Last but not least, you may find that some of the Amsterdam Airport cabs accept credit cards. GTR Ltd offer real time internet taxi reservations. Each person arriving or travelling in need of a confirmed, efficient and professional service. GTR is the most popular sevice for taxi reservations in Amsterdam Airport. Avoid stress and long queues. Hours of Operation: 24H & customer support.